The usual boxes and cables, etc.....the experiment is.....how many ways can they be connected? This stuff has been changed a dozen times since the 2002 pictures were taken. The Ameritron RCS-8V antenna switch control box, above the rig, is not currently used. The top rotator control box is for the TH7, the lower one is for the C3. The box on top of the amp has switchable coax stubs between the transciever and amp. The box on top (right) is a homebrew 10-160 set of selectable receive bandpass filters (W3LPL design) with an 20 db, low noise figure, preamp. To the left of the keyboard is a left handed Vibroplex key. The little box to the left of the TS930 is where the headset is plugged in. This station is the preferred one for running due to the narrower International Radio CW filters in the 930, which used to terrorize the bands at W6KUT's place. The amp also used to belong to W6KUT. It saw its share of abuse, and the tubes are really dark, but still put out full power. I blew this amp up in the 2003 ARRL DX contest. W6ZZ & W6KUT got it running again and it has done well in the contests this year. The SO2R audio control box is to the right of monitor. To the right of the keyboard is a right handed Vibroplex key. Just above the TS930 is the Comtek control box for the 40 meter 4 square. On the shelf over the 930 is the Ham III rotator control box for the 40-2CD 40 meter beam on tower #2. To the right of the rotator control box is the 40 meter antenna switch, and the 4 square dumped power wattmeter is on the right. The Astron 12 volt power supply to the right of the amp powers the WX0B Six-Pak. One Diawa manual switch above the Six-Pak select 80 meter antennas, the other switches in the 160 antenna, because I fried the 160 connector in the Six-Pak & haven't gotten around to fixing it. The Diawa switch on the right side allows listening on the 160m transmit or receive antennas. The Drake MN2700 tuner on top is used to match the 80m Inv L. On the top of the amp is another set of switchable stubs. 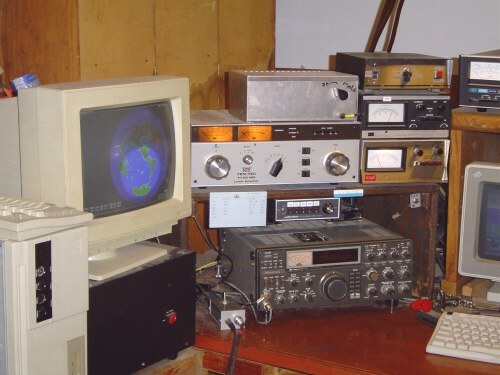 The logging computer is on the far right. The Alpha is my only "new" purchased amp (mid '83), and still seems to want to contest. 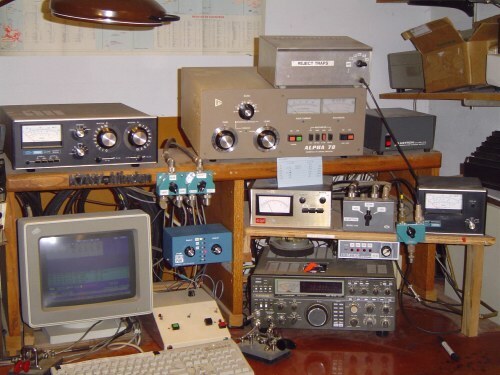 I was a contest commuter for many years, driving to San Diego to operate, and I found that the antennas at every location, did not mate well with the amp's bandpass circuits. So, I put the access holes in the left side, to retune them for each location's antennas. This 930 has Fox Tango CW filters in it and was the first "new" radio I ever owned. These are 15+ year old radios, but they they do still work, and don't cave in readily, during crowded conditions. By now, I've almost learned how to use them so I don't have to think too much about that part of the contesting problem. This isn't pretty, but till now, I was the only one to see it, and it works for me. I change things a lot here, so having everything loosely routed, with excess lengths, means easy changes. 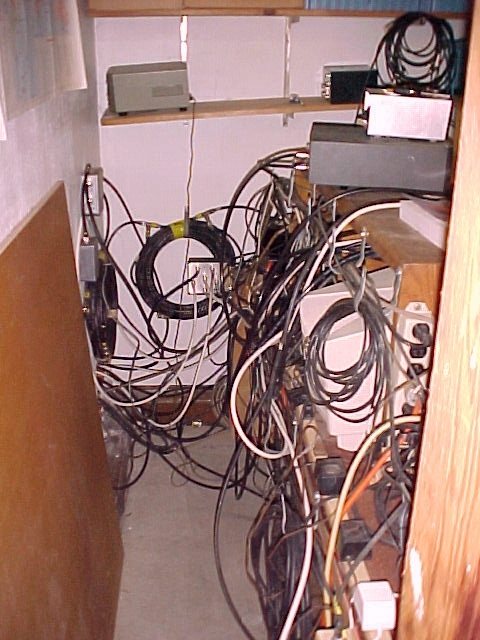 There is a need for some housekeeping to get things untangled after several configuration changes. Moving the operating desk away from the wall, during the 2000 rebuild, was one of the best things I ever did!. There is nothing quite like being able to get back there and get to everything, specially when Murphy visits a contest. The big coax coils on the left and far walls, are 40 and 80 meter 2 pole 1/4 wave stubs. The desk, that is underneath everything, is almost as old as I am. It was custom built for Gene, W6HYG (SK), in Bakersfield, Ca., in the mid to late '50's. I remember playing around this thing when I was a tot, and it was new. It ceased to be an operating position some time in the '60's in So. Calif., and ended up in one of Gene's sons garage, in the '70's as a workbench supporting photographic equipment. That son, one of my childhood friends, was going to haul it off to the dump, but I just couldn't let that happen (I wasn't even a ham then). I took it and stored it in my garage, also as a workbench for many years (taking it with me up to Washington State, and back to So. Cal. in '78-'79) Then, I finally got really interested in radio and got licensed. When I moved here (in '94), I just couldn't send it to the dump, so I dragged it along again, to sit in storage until I finally found a home for it. 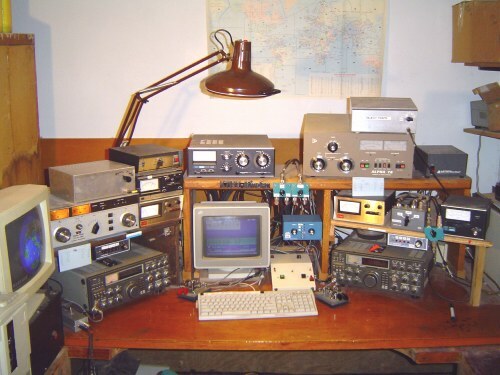 In the CQWWCW '95, with one radio & amp and a trapped vertical (Hustler 4BTV that spent 10 years on Gene's boat, before it got here, now hopelessly frozen together, and made to work with sheet metal screws) and a couple of wires, it got to go back on the air. A far cry from the "Big Bertha", and stacked Telrex beams it used to command. Everything you see in the first photo on this page sits on Gene's old desk. The top was in bad shape, so I put the epoxy coated solid core door (my very first homebrew Novice operating surface) on top of it, to make the place friendly, and the new station was born. I'm pretty sure that old purpose built Ham desk will outlive me. The shelves need to be replaced someday. The one holding the Ten-Tec was made in the mid 80's for hauling down to N6ND's multii's, the other thing came off the computer desk in my office, and I patched in another shelf. There are probably a hundred other trivia stories, like, the wall on the right is stacked full of bins of "stuff" that "Elmer" and I collected for 20 years. It's all just part of what makes this thing fun!